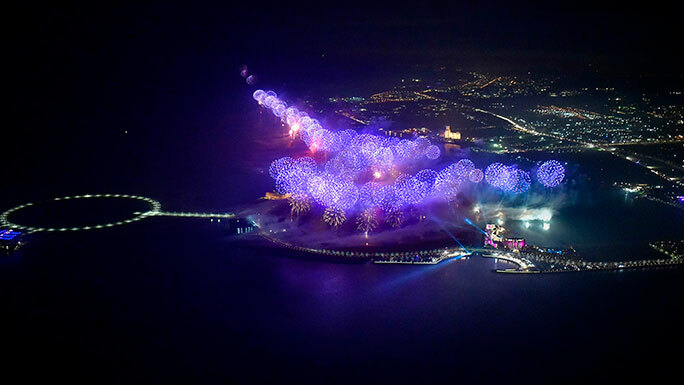 The United Arab Emirates never fails in celebrating New Year’s Eve with a spectacular fireworks show، and the arrival of 2019 has proved no different، guinness world records reported. Like last year، Marjan and Fireworks by Grucci teamed up to create a record-breaking performance at Al Marjan Island in Ras Al Khaimah. The show was one to remember by setting two records! This creative team managed to draw the Longest straight-line fireworks display which is measured in a straight line from the first fireworks station to the last. Every individual station can be no more than 2 km apart with at least 300 kg of fireworks used. The display had to last for at least five minutes. The final measurements were 13.002 km (8.07 miles). They also achieved the Longest chain of fireworks which consists of 11،284 fireworks. Eng. Abdulla Al Abdouli، Managing Director & CEO of Marjan، said: "The spectacular event highlighted the reputation of Ras Al Khaimah as the must-visit destination for celebrating the New Year’s Eve. With visitors arriving from across the world، the event served to highlight the touristic appeal of Ras Al Khaimah and to position it as a fast-growing leisure and commercial hub in the region." "We thank the leadership of Ras Al Khaimah for their guidance and support in accomplishing this event، and all the government entities in the Emirate for the exceptional team work. 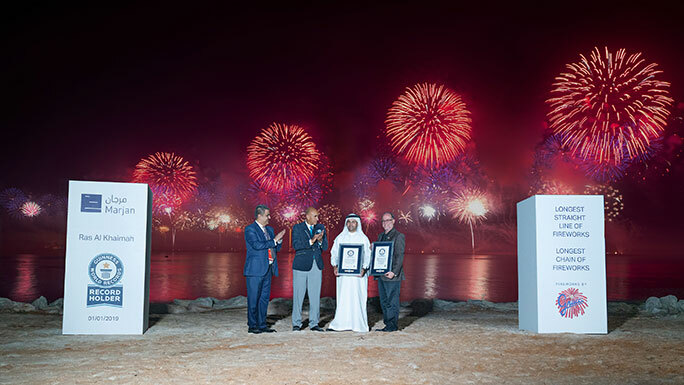 With two Guinness World Records titles set، the 2019 Ras Al Khaimah New Year’s Eve Gala has been truly historic and adds to the pride of our nation." Adding to the delight of the visitors، this year، Ras Al Khaimah has added more viewing areas around Al Marjan Island، the flagship master-destination by Marjan، as well as a wide choice of family-oriented activities. Last year’s New Year show in Ras Al Khaimah also set Guinness World Records title for the Largest aerial firework shell weighing 1،087.26 kg (2،397 lb) and spanning an area of 1 km after exploding.